Congratulations to Rob who solved the Person-of-Mystery! Good sleuthing! Yesterday's person was the famous Peggy Eaton, who during Andrew Jackson's presidency was the central figure of the Petticoat Affair. She is probably best remembered by this name, but she preferred the name Margaret, so I'll refer to her that way in the rest of this post - and as there are multiple men named John in this whole event, Johns will be mostly called by their surnames. For those who may not have heard of this whole brouhaha, here's how it happened. 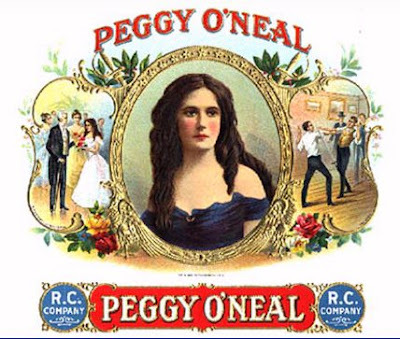 Margaret O'Neill (last name also spelled in various places as O'Neal, O'Neil, O'Neale), was the daughter of a Washington tavern owner. Her father's inn/tavern, Franklin House, being frequented by political figures in the early history of the Capital. Around 1816, she married John Timberlake, a purser serving on the USS Constitution, and the couple had three children together. 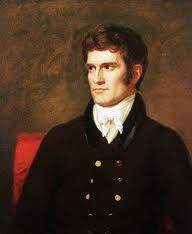 In 1818, John Timberlake befriended John Eaton, a new Senator from Tennessee and a widower (a side note here - Senator Eaton is still the youngest Senator ever elected at age 28). The three became very close friends and spent a good deal of time together. 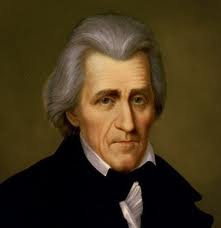 In 1823, Tennessee elected a new junior Senator, Andrew Jackson. Eaton and Jackson became good friends in the Senate as Eaton familiarized Jackson with Washington life, recommended Jackson stay at the Franklin House upon his arrival and introduced Jackson to Margaret. Jackson and his wife became good friends with the Timberlakes and Eaton and Mrs. Jackson became fond of Margaret and particularly enjoyed her musical skill. Timberlake however was often in need of money and volunteering for long voyages at sea. For his part, Eaton even unsuccessfully petitioned Congress to assist his friend financially. While Timberlake was away, Eaton would often accompany Margaret to events around Washington. In 1828, Timberlake officially died of "pulmonary disease" while the USS Constitution was in the Mediterranean. However, rumors soon circulated about this sudden change of events. 1) As a teenager at the tavern, Margaret had been courted by several suitors. With one such she refused his affections and he took poison and died. 2) It was rumored that she had been romantically linked to the son of the Secretary of the Treasury under Thomas Jefferson. 3) She had supposedly attempted elopement with an aide to Gen. Winfield Scott and while climbing from a bedroom window she knocked over a flower pot. Her father, thus awakened, pulled her back inside window and promptly ended the affair. 4) Margaret and Senator Eaton had been carrying on an affair, perhaps as far back as 1818. Proof of which was a quiet January 1st marriage, less than a year after Timberlake's death. 5) While on one of Timberlake's extended voyages, Margaret had a miscarriage that could only have resulted from an adulterous liaison. 6) Timberlake had been made aware of the affair between Margaret and Eaton and committed suicide aboard ship in a fit of despondency. 7) Later wild exaggerations even accused Eaton of fathering a child with colored woman. Owing to their long-standing friendship, rumors began to get nasty about Eaton and Margaret. Eaton for his part adored Margaret and sought to silence the rumors. President-elect Jackson encouraged Eaton to ignore the press and marry her to end the unfounded gossip. A quiet ceremony was performed on January 1 in the year following Timberlake's death. Rather than silence critics, the wedding was considered all to soon and the rumors only increased. People like Louis McLane, a Maryland politician, proclaimed that Eaton had, "just married his mistress – and the mistress of eleven dozen others!" The Eatons soon became the topic of all manner of awful talk. 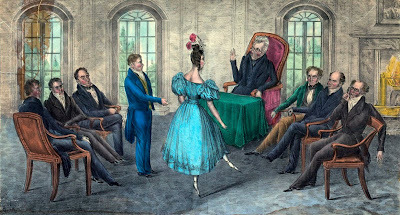 Andrew Jackson largely ignored (or wasn't aware of the social disapproval perhaps due to the loss of his own wife) the gossip around Washington and soon appointed his long-time friend Eaton as Secretary of War. However, most of the cabinet wives (whose ringleader was Floride Calhoun, wife of Vice President John C. Calhoun) openly snubbed and isolated Margaret. For her part, Margaret's personality did little to dispel the rumors. She was outspoken, flirtatious, young and pretty, and seemed to care little about convention. Nevertheless, quickly the clear distain the cabinet wives showed toward Margaret began to rattle her. For his part, President Jackson would have none of this. His own wife Rachel, had been the subject of vicious gossip before his election and Jackson always blamed the vitriolic press for her failing health and ultimate death months before taking office. Jackson made multiple attempts to show favor to Margaret, clear her reputation, and stop the rumors, but the situation continued to grow worse. At one point, Jackson brought together his entire cabinet (minus Eaton and Calhoun) along with two ministers who had publicly denounced Margaret. He brought affidavits attesting to Margaret's innocence and attempted to clear the Eaton's on wrongdoing. Jackson believed the meeting successful, but was mistaken. 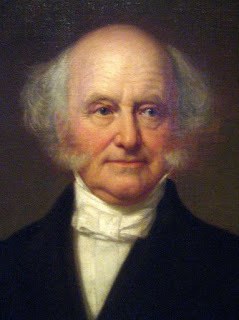 Secretary of State Martin Van Buren was one of the only cabinet members to side with Jackson and the Eatons, but Van Buren had neither a wife or daughters at the time. 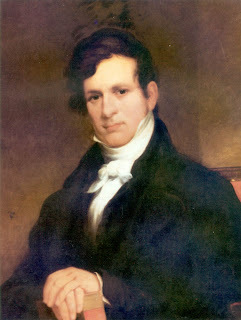 In 1831, Jackson pressured all his cabinet members, including Eaton, to resign. He then recomposed an entirely new cabinet for the remainder of his term. Largely due to his support of Margaret, Jackson elevated Van Buren to the Vice Presidential ticket when Jackson ran for reelection. 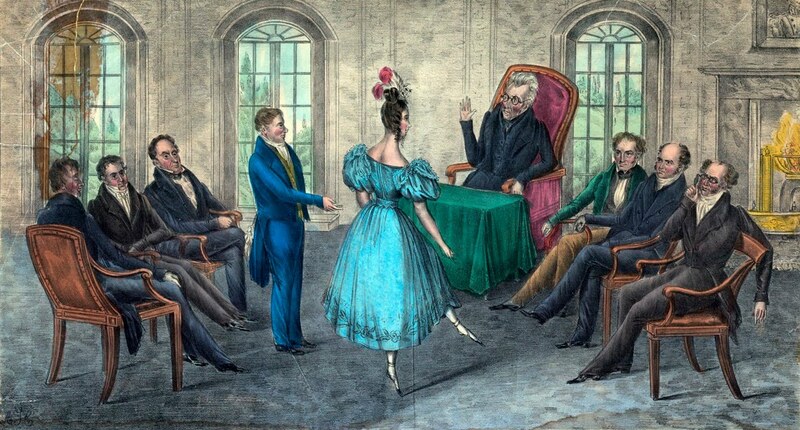 Both Van Buren and Calhoun credited the "Petticoat Affair" with later lunching Van Buren into the presidency. After his reelection, Jackson began to realize that there was no easy solution to the problem and moved Eaton out of Washington by appointing him Governor of Florida Territory and later Minister to Spain. Curiously, despite Jackson's unwavering support of Margaret, in 1840 Eaton turned on Jackson politically and the two did not reconcile until just before Jackson's death. Eaton died in 1856 and left a small fortune to Margaret and for a short period her wealth and time had tempered society's memory allowing her to achieve a quiet respect in Washington. Margaret's two daughters from Timberlake married into well-connected and prominent families and things seemed to be going along pretty well. At this point, one might have a great degree of sympathy for Margaret. However, she thrust herself back into the center of Washington gossip again in 1859 when at age 59, she married her granddaughter's 19 year-old Italian dance instructor, Antonio Buchignani. Again a social pariah, Margaret retained a small fortune, until seven years into the marriage Buchignani ran off to Europe with the now 17 year-old granddaughter, Emily, along with most of their money. 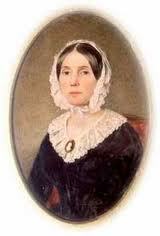 Margaret was able to obtain a divorce, but not the money and she died rather poor in Washington in 1879. The photo from yesterday was taken towards the end of her life. What people will do for money and "love" is truly astonishing! Andrew Jackson is The Web’s Most Wanted Andrew! More raw data is here. Misha, I see you enjoy names and name meanings. I looked at your profile and noticed you are from Netanya, Israel. I had never heard of this place before now, but what a nice name. A town named for Nathan. Thanks for the lesson. If you'd like to read a well documented historical fiction on Peggy Eaton, see "The Breath of Suspicion" on Kindle.